Mr. Marvin Henry Jernigan, 88 year old resident of the Mount Olive area, passed early Friday morning, March 29, at his home. Mr. Jernigan was preceded in death by his beloved wife, Dorothy Holloman Jernigan; a granddaughter, Kristie Jernigan Lee; his parents, David Henry Jernigan and Lucy Ella Whitfield Jernigan; a brother, Jimmy Jernigan; and two sisters, Margaret J. Wall and Helen J. Garner. He is survived by a son and daughter-in-law, Doug and Aileen King Jernigan of Mount Olive; a daughter and son-in-law, Meg and Danny Jackson of Mount Olive; three grandchildren, Allen Jernigan and wife, Brianna, Kimberly Jernigan Smith and husband, Scott, and Courtney Jackson Lambert and husband, Jim, all of Mount Olive; nine great-grandchildren, Hannah Lee, Gavin Lee, Cody Smith, Ailee Smith, Annalee Smith, Sarah Jernigan, Noah Jernigan, Ella James Lambert, and Olivia Lambert; two sisters, Shirley J. Deal and Doris J. Ellis, both of Mount Olive; and several nieces and nephews. The family also wishes to acknowledge a dear friend to Mr. Jernigan, Nancy K. Brock of Mount Olive; and his faithful and loving caregivers, Juanita Stroud, Christy Crawford, and Flora Chambers. They also are grateful to Dr. Kevin Talton and the Family Medicine staff for their dedicated and professional approach in assisting Mr. Jernigan maintain a good quality of life for as long as possible. Mr. Marvin Jernigan is being remembered as a good man who loved the land. While he was a life-long farmer, he also was employed with Dewey Bros. in Goldsboro for 39 ½ years where he was foreman of several departments. 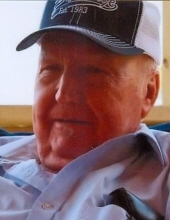 He was a life-long member of the Northeast Original Free Will Baptist Church and had served in the United States Army with the chemical corps as a rifle specialist. His life will be remembered in a service on Monday, April 1, at 2 p.m. in the chapel at Tyndall Funeral Home. Officiating will be the Rev. Richard Cuddington and the Rev. Jeff Dail. Visitation will follow the service at the funeral home, and at other times, his residence is open for in which friends and family may call. His burial will take place in the Jernigan Family Cemetery in a private setting. In lieu of flowers, it is requested that memorial gifts be made to Northeast Church’s youth program, “Faithfulee,” attn. : Brianna Jernigan, 489 Northeast Church Road, Mount Olive, NC 28365. To send flowers or a remembrance gift to the family of Marvin Jernigan, please visit our Tribute Store. "Email Address" would like to share the life celebration of Marvin Jernigan. Click on the "link" to go to share a favorite memory or leave a condolence message for the family.